The bag pattern was very pocket deprived originally. I drafted a release pleat pocket for the sides. These should be good for small items like makeup, a pair of summer sandals or in my case notebook and pen for murder mystery weekends. 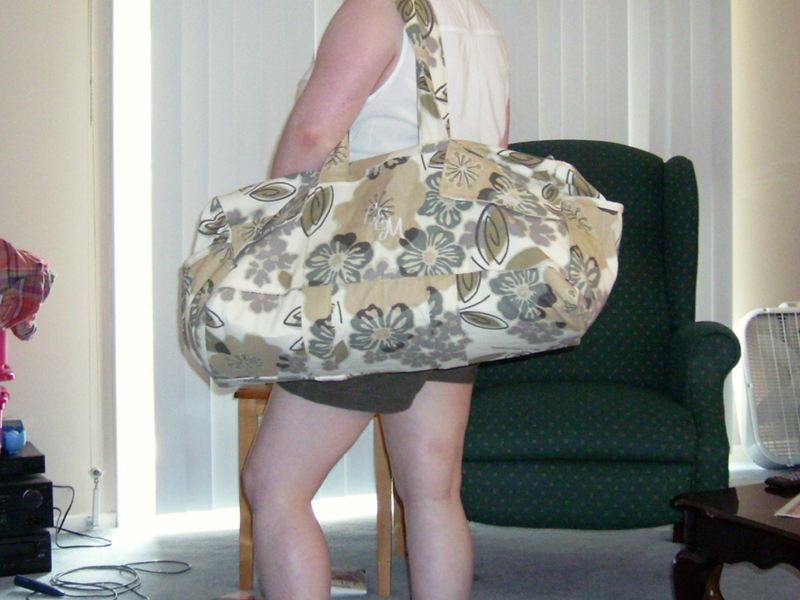 Then for the front, I did rectangle for three pockets. I monogrammed the center of the rectangle with the Singer Deluxe Monogrammer I got for my birthday (early). 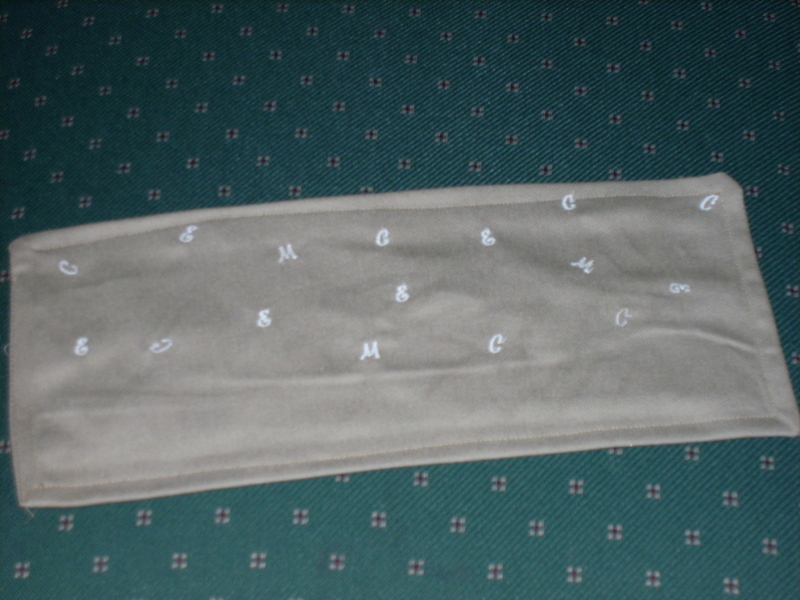 The outer two pockets have button closure flaps (using the Professional buttonholer). They would be good for cell phone, sunglasses, or other small items. As for the lining, it too received a personal touch. The first time, I pulled out the Singer Deluxe Monogrammer to put a couple of flowers in the corner. A reminder before using any attachment, check to make sure that there is enough thread in the bobbin. I ran out of thread right in the middle of the first flower. After a couple of lack luster flowers, I changed my machine over to the Singer monogrammer (the one that makes 3/8th inch letters) but forgot to put in the throat plate. The first letter turned out horribly. I realized the next morning why. So the other lesson I learned was to always have the manual out on the sewing table. So the pocket was re-cut from the lining fabric. 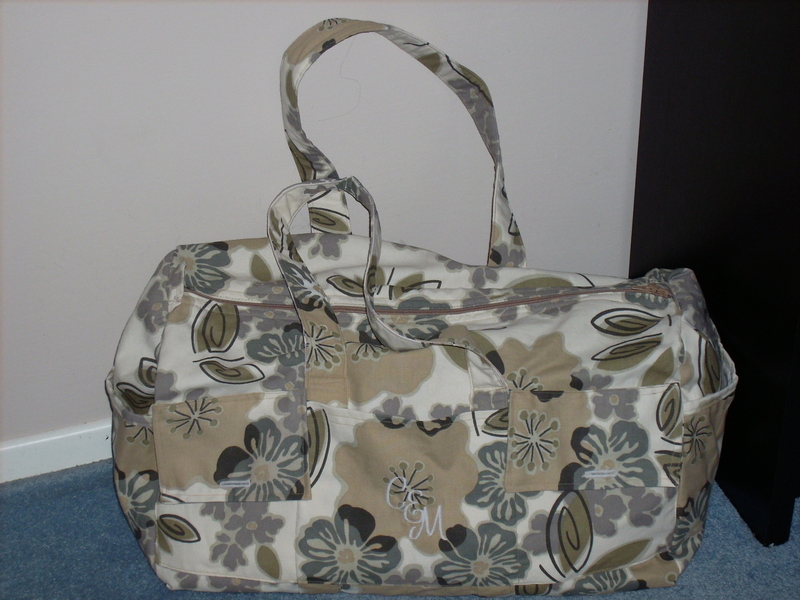 For a neatly finished zipper, it was hand sewn into the top of the bag. To get more cushy handles, I used felt (which I had at home) instead of sew in interfacing. Anyways, I ran out of sew in interfacing. The felt gives a nice weight to the strap. Instead of a cardboard insert for the bottom, I opted to use a rectangle of plastic canvas. Then I did a couple of stitches through it to hole the bottom into place. I picked two coordinating remnants from the home décor section of Hancock fabrics. I picked up more fabric than suggested on the pattern envelope because I knew I wanted to add some pockets to the bag. I just wasn’t certain if I wanted to use the lining fabric or the outer fabric for the pockets. So all total after picking up thread, zipper and interfacing the total cost was about $20. Fairly close to the price I saw on just plain old ordinary travel bags at a big box store. The couple extra dollars for my bag was well worth it for all the individual style I got in my bag. I found this book, “Creating Crystal Jewelry with Swarovski: 65 Sparkling Designs with Crystal Beads”, at the used bookstore. The author is Laura McCabe, I have seen several of her pattern contributions to Beadwork magazine. From knowing that I had a fairly high expectation of the projects in this book. 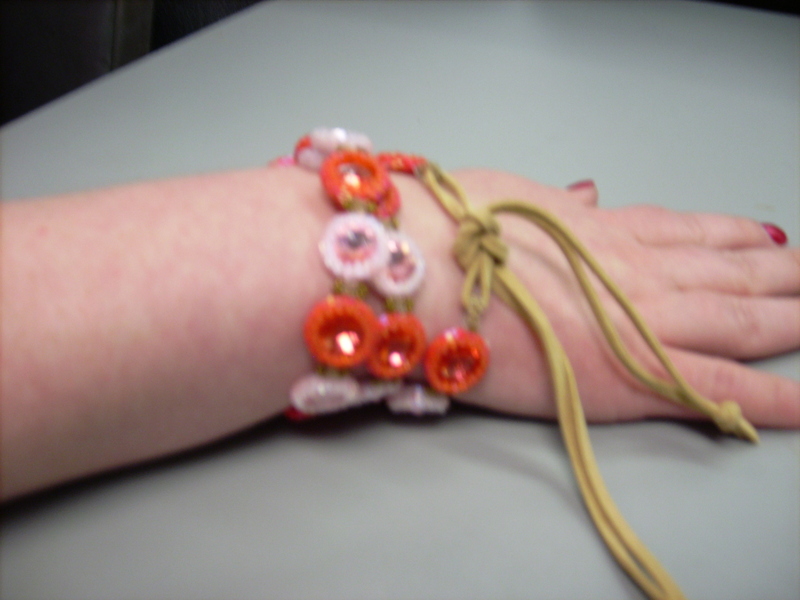 I made the crystal wrap around bracelet. It is definitely a statement jewelry piece. (And apparently very on trend, granted I didn’t know wrap bracelets were until I saw them show up everywhere after I brought the crystals for my bracelet.) But going off the pictures in the book, all the pieces in the book are statement pieces. This bracelet more than exceeds my expectations. The instructions are pretty decent but I wouldn’t say this is a beginners project at all. One needs to be at least fairly comfortable with peyote stitch or at least have bezel set a crystal before would really help. There isn’t too many pictures to follow. The final products picture in the book is great looking, but it doesn’t really show the pattern of the 15 color A and 12 color B. My suggestion is to layout your color pattern beforehand and buy your beads and crystals by what you want. Since these were going to be the smallest ravolis I have made so far, I decided to use the 12mm option instead of the 10mm one. There are twenty- seven beaded bezel set rivolis in this bracelet. I don’t think anyone would want less than the twenty seven. After looking at it on my wrist, I think I could have used at least one more crystal. It wraps around my wrist three times and I have about a 7 inch wrist. Anyone with a larger wrist should expect to use more than twenty-seven to achieve the wrap around look one desires. To set my crystals, thirty-two beads seemed to be the best fit. The chart given inside the book recommended thirty beads. I am not sure if the difference is because of I used a different style of rivoli by accident, tension, or even changes in how the beads were made. I didn’t add all the embellishment that was in the pattern. 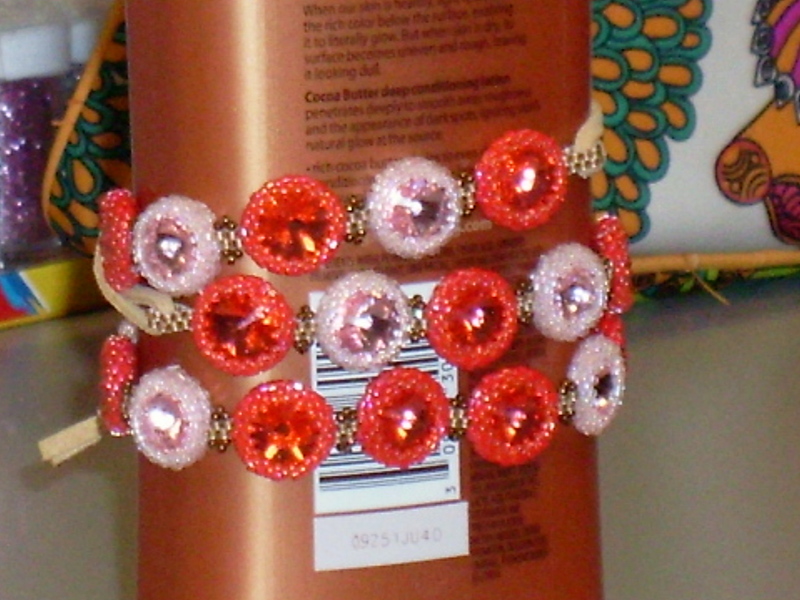 I used padparadscha and light rose as my color combination- two of my favorite colors. Setting each stone in bead of its respective color, I had very bright and rich colors. 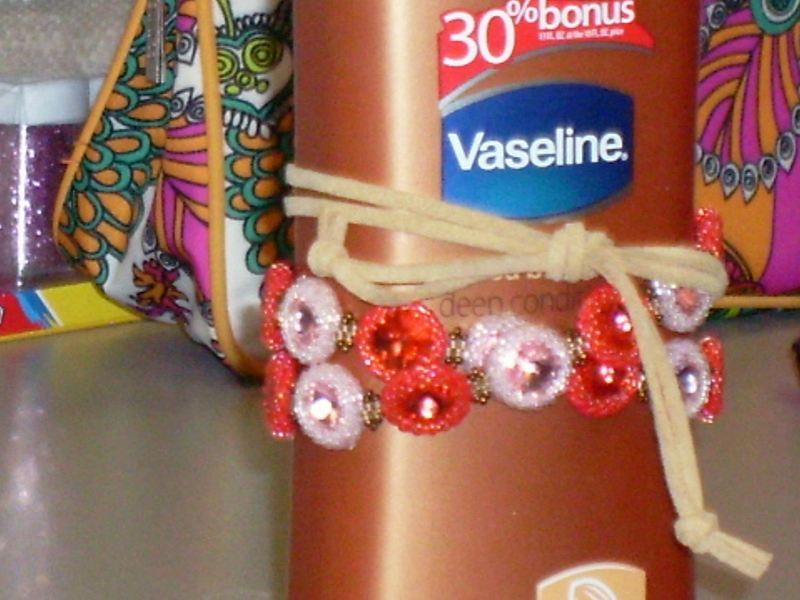 Adding the beaded picot to the edges of the ravoli would probably been too distracting. I did add the picots to the pale copper rivoli connections.